Jesus and Yoshi go way back. How else do you explain the huge success of Super Mario World? Well other than the fact that it was a great game. Ian Gabriel Jordan sent in his tattoo by Ryan Willingham of Blu Gorilla Tattoo. He says, and I quote, “i got f*d up while I was station in the navy and though it would be cool”. 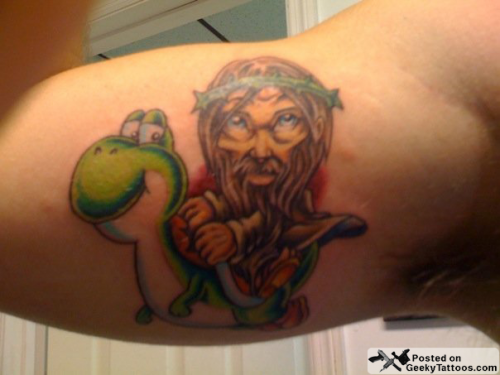 Tagged with bicep, Blu Gorilla Tattoo, Jesus, religious, Ryan Willingham, Super Mario Brothers, Yoshi.